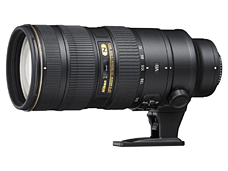 TOKYO — Nikon Corporation is pleased to announce the upcoming release of the new fast telephoto zoom lens AF-S NIKKOR 70-200mm f/2.8G ED VR II for use with digital- and film-SLR cameras. A number of unique Nikon technologies have been adopted for this lens, including the use of seven ED glass elements, Nano Crystal Coat, a vibration reduction (VR II) system that provides camera shake compensation equivalent to increases in shutter speed by four steps, and a Silent Wave Motor (SWM). This fast telephoto zoom lens provides the excellent performance and superior image quality demanded by professional and advanced amateur photographers. With release of this lens, Nikon has structured an incomparable NIKKOR zoom lens system that also includes the current AF-S NIKKOR 14-24mm f/2.8G ED and AF-S NIKKOR 24-70mm f/2.8G ED for complete coverage of focal lengths from 14mm to 200mm with support for a maximum aperture of f/2.8 throughout the entire range. The AF-S NIKKOR 70-200mm f/2.8G ED VR II offers excellent performance throughout its range of focal lengths, from the natural rendering characteristics of mid-range telephoto positions to the compressed perspective of telephoto positions. The lens makes the most of a wide variety of scenes, from portraits to staged events as well as sports photography under nighttime lighting, press photography, and scenes that require soft rendering of out-of-focus portions. The use of seven ED glass elements provides the ultimate in rendering characteristics for capture of images exhibiting excellent resolution and high contrast. The additional use of Nano Crystal Coat effectively suppresses ghost and flare for clear images. Adoption of the Silent Wave Motor (SWM) allows for smooth and quiet autofocusing that makes the most of camera autofocus subject tracking systems. The lens also provides superior operation with three focus modes — M, A/M, M/A — for manual focusing or manually fine-tuning focus acquired with autofocus by simply rotating the lens' focus ring. The vibration reduction system (VR II) provides camera shake compensation equivalent to increases in shutter speed by four steps*. Two vibration reduction modes are available. NORMAL mode: The vibration reduction mechanism reduces ordinary camera shake. Panning is also supported. ACTIVE mode: The vibration reduction mechanism reduces extreme camera shake, such as that which occurs with shooting from a moving vehicle. Specifications and equipment are subject to change without any notice or obligation on the part of the manufacturer. Information current as of July 2009.